Décor Idee has been around for the last three years, but has recently shifted on June 1st, to Rangs Arcade in Gulshan Avenue (Gulshan - 2). The store comprises mainly of furniture, most of which is made out of Sea grass with a Mahogany polish. The pieces are, as Towhida Hoque (owner and designer) mentions, simple with no carvings or particular work done on them as such. Instead, one may find sprawling and comfortable, yet tasteful three seaters, two seaters and the like that would add warmth and style to any living room. 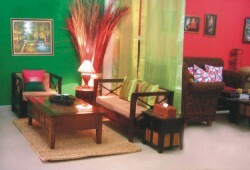 Asides furniture, numerous accessories may draw your attention. You may find traditional Katha on Tangail saris, in the form of cushion and bed covers, place mats and throws. Spurts of colour in flower prints permeate some cushion covers. There is an assortment of lamps, globes, even antique furniture that Hoque has chosen with care, and reproduced similar patterns and designs. A combination of bamboo and wooden trays with coasters are something unique that you may find at the shop. Some of their accessories have been imported, for instance silver jewellery, silver flower vases, tapestry, zari throws, runners, wooden partitions, and so on, all from places such as Thailand, India, and Belgium. There are attractive brocade runners, zardosi placemats (some of these are made out of Mirpur saris as well), cotton quilts, screens made out of Tangail saris and fine cotton fabrics from Beximco. Hoque also plans to add some Belgian crystal and Chinese ceramics to her already burgeoning collection. In short, a lot of innovation and care have gone into choosing each piece that the owner has designed, reproduced or imported; it has been done in much the same way one would choose to decorate one's home. Though some products have been imported from abroad, most of what you may find at Idee Décor are made out of Bangladeshi materials and fabrics. Prices are reasonable enough with sofa sets ranging from Tk4,000-Tk9,000, Katha Bed covers from Tk2,000-Tk4,000, and partitions from Tk8,000-Tk12,000, to name a few. Hoque is bringing out a new line of children's wear as well. After more than a decade glass bangles have come back to sweep up the market. But these bangles are no longer the plain thin mono-coloured ones that most of us wore as kids. These bangles have many layers of glass that can be seen through one another and are in various shapes and sizes. These bangles have more of a glass-blown effect. Made in India, a pair of these bangles costs Tk. 60 and is available at True value (Sunrise Plaza, Mirpur Road). Do you have a dull outfit that you don't like but don't want to throw away either? Are you looking for something to jazz it all up? Well chundri dupattas are the rave these days and they are the perfect solution to spicing up your wardrobe. Sold as separates, these dupattas are made in India or Pakistan and come in Italian crepe and georgette. The one's in crepe cost Tk. 450 while the georgette ones cost Tk. 400. Both are available at Sahara (Sunrise Plaza, Mirpur Road). Having a tough time storing make up? Are you at a loss before a trip wondering how you can pack your jewellery? Well don't worry, there's just the thing for you. Miniature trunk shaped boxes are just the solution. Small enough to fit nicely into your suitcase, yet large enough to fit enough make-up or jewellery, these Korean boxes are sturdy and trendy. They come in various shapes, colours and sizes and have strong clasps that hold the lid in place. They cost Tk.1,050 and are available at the Ital Shop (Sunrise Plaza, Mirpur Road). If you're tired of wearing round bangles or want something that goes with a western outfit, square bangles are just the thing. They come in too many shades to count and are plastic, so you won't have to worry about breaking them. They cost Tk.60 each and are available at Jordana (Sunrise Plaza, Mirpur Road). Decorating with local products has been in vogue for quite some time. But these days, using functional local products is becoming quite the rage. So with the summer heat beating down and the electricity playing hide and seek, why use poor replicas of Chinese or Japanese fans to get some air? Instead, get a traditional Bangladeshi 'haat pakha', the ones that are still seen in villages. They come in vibrant shades and have intricate woven patterns and above all are decorative besides being functional. Such hand fans cost Tk.60 and are available at Rong (Sunrise Plaza, Mirpur Road). Giving yourself a manicure is as simple as ABC if you have the right tools. What are the right tools? Well apart from the large and small clippers and nail file, there's also the cuticle cutter, the tweezers and the nail scrubber. If your armed with all these things, you won't have to go to a salon to get your nails done. You can do it yourself right at home. So why not get yourself a complete manicure set. The set contains all these tools that come in a small box that is perfect for travel too. The set costs Tk. 250 and is available at Priyo (Road 5, Mirpur Road). A woman cannot go anywhere without her handbag. If you are out hunting for a fancy handbag to match that new outfit you bought recently, but are not particularly interested in leather ones, give Kumudini a try. Embroidered tissue and Joysree silk handbags in mustard, army green, and basic black amongst others may be found on display, and will cost between Tk.250-Tk.600. How did this aforementioned die-hard rumor get started? Well, it probably has its roots in biology. Most of us do indeed lose the equivalent of 8 to 11 cups of water from our bodieseveryday through our breathing, sweating, and kidneys. However it turns out most beverages and foods contribute to your water intake. Milk, soda, juice, and even caffeinated drinks all contribute to our water intake since they are made up almost completely of water. Many foods especially fruits and vegetables also contain lots of water and help replenish your losses. In fact, foods provide about 20% of our water intake every day. One more good reason to eat lots of fruits and vegetables! Although many might tell you otherwise, your thirst is usually an excellent indicator of your water needs. You can drink when you are thirsty and once you do that you can rest assured that your drinking needs have been more than taken care of. Whether it be eight glasses or more or less it ceases to matter. Once you drink when thirsty you will in all probability not find yourself dehydrated. While coffee does contain caffeine and while caffeine is a diuretic, you're getting a lot of water along with that caffeine which more than offsets any losses. While coffee is not as good as water at hydrating your body, it still contributes to your overall fluid intake as do caffeinated sodas and tea. And, if you are a habitual coffee drinker, the body seems to adapt and minimize the dehydrating effects of caffeine.